Boerum Hill, Cobble Hill and Carroll Gardens—or as real estate agents say, BoCoCa—are three adjacent Brooklyn neighborhoods with lovely tree-lined streets, vintage shops and landmarked brownstones. Although they are often lumped together due to proximity, each community has its own vibe. 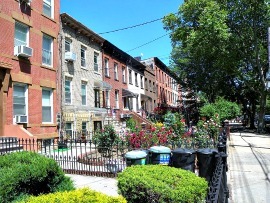 Boerum Hill is home to movie stars and bistros, Cobble Hill continues the historic charm of its tony northern neighbor Brooklyn Heights while Carroll Gardens is slightly grittier and full of churches, quaint houses and old-school Italian eateries. All, however, are super-kid-friendly. Popular green space Carroll Park hosts frequent FREE families events, ArtsCetera and the Painted Pot offer drop-in activities, and awesome enrichment programs like Beam Center, Pixel Academy and the Brooklyn Strategist challenge kids to think (and play) outside the box. Our guide to Carroll Gardens, Cobble Hill and Boerum Hill has the scoop on the best places to eat, play and experience with kids. We hope you enjoy getting to know the neighborhood with your family.